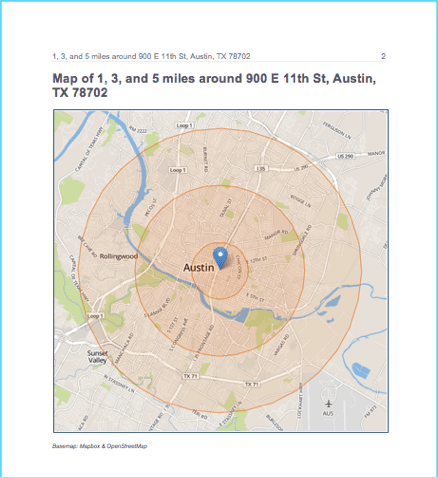 Get the most current and popular demographic data for 3 rings around an address. Skip spending 40+ hours on Census.gov hunting for data or learning new software. I'm the lucky lady who will be putting your radius report together. Shhh....don't tell anyone, but I've been working with demographic data for 10 years now. Let me know if you have any questions about radius reports. You can reach me at 1-800-939-2130. 5,417 businesses & marketers use Cubit to get the data they need. Pick your location on the map below. On the next page, tell us what data you need by filling out the form. Radius report pricing starts at $49. We offer a 100% Money Back Guarantee! You'll receive an email with your radius report the next business day (Monday - Friday) by 7 pm CST. Our customers say that getting their questions answered by real people is the best part of working with Cubit. Call us: 1-800-939-2130. Your Business is Unique. Get Your Radius Report Customized to Fit Your Business. Since 2009, our clients have been asking us to customize their Radius Reports to help them get the right data to make the best decisions. Below are the most popular customizations. Free Your basic radius report includes age data using 10 year intervals (e.g. 0 to 9), but some businesses need more precise age intervals (e.g. under 5 years or 85 years and over). +$25 Your basic radius report includes county population projections, but some businesses want city level population projections as well. Our team first researches current city population projection data from government data sources. If we can’t find current enough data, then we purchase population projection data from a private data vendor. +$50 The only time that you are happy about lots of traffic is when it’s right outside of your business’ door. You can add the most current year estimates from Kalibrate. We use Kalibrate data because: 1. Kalibrate sources their data from public & private data sources. This means that for certain areas, they have more traffic counts than the public data sources alone. 2. Kalibrate’s data are consistent across states. If you need a radius report in New York city where you want to see traffic counts for both New York and New Jersey, your traffic data will be consistent rather than using 2016 New York data versus 2018 New Jersey data. If the Kalibrate traffic data doesn’t have enough current traffic counts for a particularly rural area, then we double check with either the Federal Highway Administration dataset or the state Department of Transportation datasets. So you get the best of both worlds – current data from a private data source supplemented by government data when appropriate. +$50 For some locations, 3 radius distances just aren’t enough. Our team manually builds you a report with data for 3 more radiuses. So you can get data for up to 6 radiuses in 1 report. +$50 & 1 day If drive times are key to your business, consider getting demographic data for travel sheds (e.g. 5 minutes, 10 minutes and 15 minutes) instead of radiuses (5 miles, 10 miles and 15 miles). We need an extra day to generate drive time polygons and load them into our system, so you’ll get your report in 2 business days instead of 1 business day. +$50 & 1 day If you email us a map image with your area of interest drawn on it (or even better, a spatial file), you can get a report with demographics for your custom area instead of for radiuses. Contact Kristen to talk about this option. We need an extra day to build your custom area and load it into our system, so you’ll get your report in 2 business days instead of 1 business day. +$199 & 1 day If you are interested in current competitor locations for 1 type of business, you can get a map image, an online, interactive map and an Excel spreadsheet with competitor locations. We typically purchase competitor location data from private vendors depending on your industry. Then we run intersection calculations to only display the locations that intersect your largest radius distance in your maps. We need an extra day to complete these tasks, so you’ll get your report in 2 business days instead of 1 business day. +$100 & 1 day If you must have demographic data that’s above and beyond the most popular data points in our basic report, our team can do custom manual calculations and add the results to your report. Some popular custom calculations are health insurance, vehicles available, mean or average income, employment, language, median age, and veterans. Contact Kristen with questions. We need an extra day to do these calculations, so you’ll get your report in 2 business days instead of 1 business day. Enter an address or zip code and the map will update to show you the location surrounded by 1-, 3- and 5-mile rings. We will use the map marker as the center point for your report.